Yosemite National Park is probably what kick started my interest in photography. It was the location of the photographs by the amazing Ansel Adams that I admired when I was 14 and why I first started experimenting with photography. I first travelled there around 15 years ago and like anybody that has been there will know I was amazed by the magic of the shear cliffs of El Capitan and Cathedral. The view as you come through the tunnel is straight from lord of the rings. I returned there once more and then got the opportunity to return more often as I moved to San Francisco, California in 2016. I was also lucky enough to visit in the winter of 2016/17 which was incredible. Following this winter trip I produced a 2 part vlog entitled "Landscape Photography - Yosemite in the Winter". This 2 part video has some great information about photographing Yosemite and follows me on location with a D800. Part 1 is below and part 2 is further down in this article. I wanted to share in this blog some of the gear I used to take the photographs and talk about the locations I went to in a bit more detail. When I first went to the area and search the web for information for landscape photographers and wanted to provide more useful information. Yosemite has so many areas to shoot that are accessible from the valley road - and this blog aims to list my top 7. Obviously there are other locations to the ones listed below but I feel that this is a fairly good summary of the places I found to be best. The obvious one is tunnel view – this is the classic Ansel Adams image and is best photographed at sunset to catch the light on El Capitan (although you can get some great light at sunrise). It is difficult to get a unique shot from this location though and you really need clouds to get a great image. 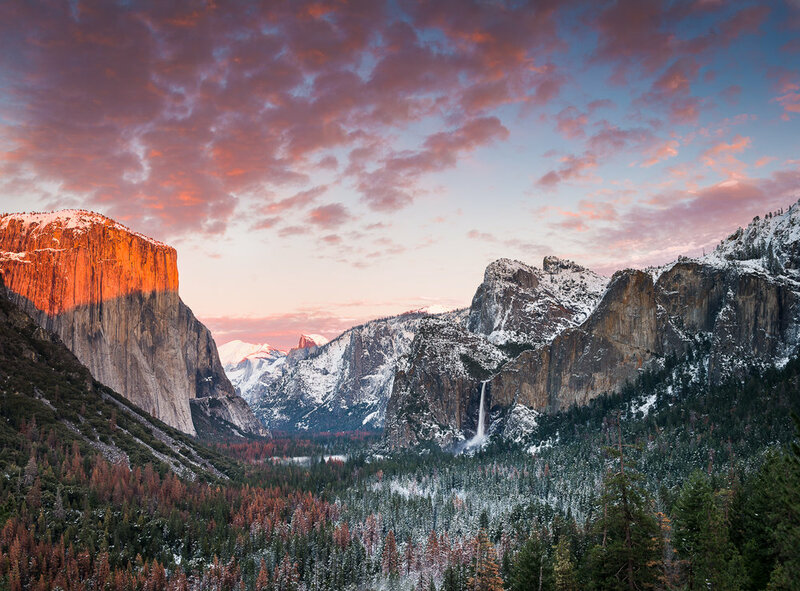 Tunnel view gets very busy at sunset so make sure you arrive early. It is a great place to watch the sunset and the mist form in the valley. Also - why not be creative and take a timelapse (as you can see in the start of part 1 of my Yosemite vlog I did just that with my Yi 4K+ on a tripod). Remember to stay after the sun has gone down though as the purple glow afterwards is sometimes incredible! Take the image below - I was just packing up and ready to leave - luckily I had my Fuji X-T2 and took this image handheld! The Merced river meanders through the valley and it is well worth hiking along it to find something different. If you are at the east part of the valley you can get El Capitan in the background with the wonderful Merced river as a leading line. I have marked on the map the exact location of this shot as it is a bit hidden away and not an obvious location. You need to park south of the river and hike down to this location. The hike up to Vernal falls is amazing and the falls themselves are worth photographing. However, it is the vistas that you get whilst you are walking up that are really stunning. And in fall the you get splashes of color from the aspens and other deciduous trees. A great place to photograph Yosemite falls is from is just off the swinging bridge carpark. You can either shoot from the bridge itself or wonder down the river and get some unique shots. This image was taken with my 70-200mm lens (a lens that is really useful to have in Yosemite!). The trees in this shot still have a hoar frost from the cold clear night. Most people that head up the Glacier Point road go to Glacier Point at sunset. But if you park 1 mile before you get to Glacier Point you can hike up to Sentinel Dome. It is an amazing hike and the views when you get there are equally breathtaking. There are compositions in many directions from here but I like shooting back towards the sun and getting El Capitan from above. Remember to take a head torch as when you come down it will be dusk and it goes dark very quickly. The mornings are often the best time to take photos in the winter as the hoar frost lingers on the branches of the trees and creates a crystal coating on the ground fauna. However, closer to sunset you often get fog setting in and this can lead to great images throughout the valley but mostly in the meadow areas at the east and west end of the valley. I try to avoid shooting in the middle of the day as the harsh light is difficult to control. However you can use El Capitan or other large granite faces to reflect the light and that reflected light is great for brining out detail in images. If you are lucky you will get rays of sun through the evening mist like the shot I took below. Good luck!